In the town of Rockford, which 6 or 7 years ago tied for the worst place in America, its farmers market was the catalyst for 57,000 visitors last year - 92% of whom came from outside the downtown area and 29% from outside Rockford. 67% visited other downtown retailers, generating another $1.1m in spending. 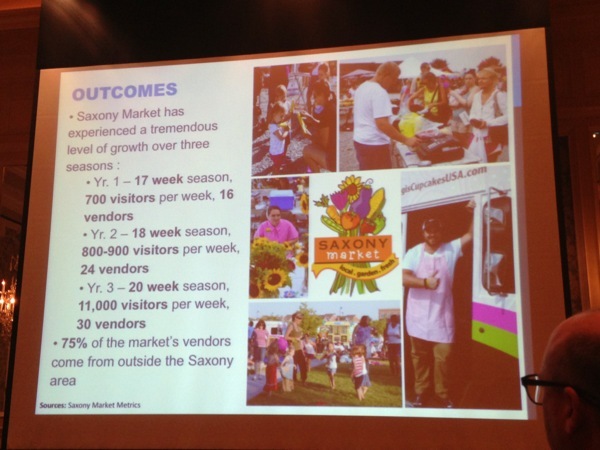 In Saxony, its farmers market - with 16 vendors - had 1,700 visitors a week visitors over 17 weeks in year 1. In year 3, it had 30 vendors and 11,000 visitors per week over 20 weeks. Spanier goes on to challenge the planners and urban designers in the room to understand that community outreach and collaboration goes well beyond a town hall session or a 5-day charrette and that planning and implementing a farmers' market is an opportunity to bring people together. But, he warns, it's just like your garden; you need to nurture it. Or like a commercial property that you own: you need to maintain it. Start with a detailed business plan, and a clear idea of what you're wanting to achieve. We switch pace dramatically - and accent I'm happy to say; as this is my last session before I head home to Australia I thought it was a nice touch that virtual-Australian (OK he was born in Mauritius but that's no Mauritian accent you're hearing), Gilbert Rochecouste takes the podium. A flamboyant showman who used to be the GM of the southern hemisphere's biggest shopping centre, he realised his heart was really in the village. Now, he explores "how we go deep and not wide in place making" and his passion is markets and food and the theatre of both. He talks passionately and lovingly about the 50 lane ways that have put Melbourne on the world map. "They're the living system of cities; the DNA," he says. "They give you that sense of deep intimacy, of place; they're eclectic and gritty." He talks about markets as economic, cultural and social generators: they attract crowds, they create confidence around the precinct, they're catalysts; they're marketable and a great testing ground. But markets need to be authentic to work. "We're good at doing beige but we need to bring in the grit," he says. He claims that cultural diversity is one of the keys to a great market, and that characters and traders are the best place makers. "Get the collection of the right traders," he advises, "because bad coffee can kill a place, have you noticed?" 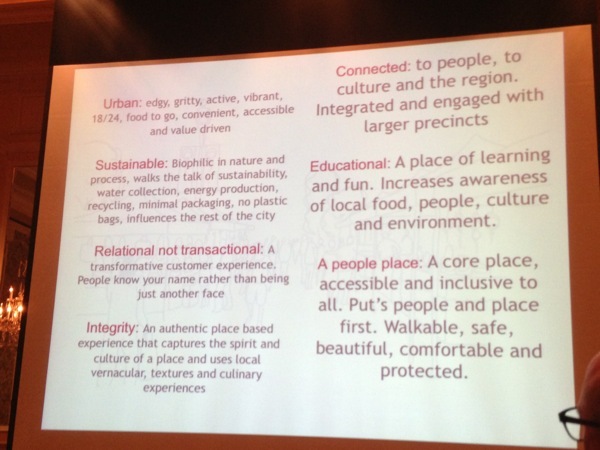 And look for opportunities for theatre - what we crave in an increasingly bland retail world. Help your market tell stories, because "each great city has five to ten great rituals that are embedded in the psyche, and these create a sense of place." Or in Melbourne go to Queen Vic market - with the biggest organic section in the southern hemisphere, and 25 delis; it has critical mass and it's a destination. Rouchcouste also talks up the power of the night markets to activate your night time economy. The key is to have a compelling story and concept, get the retail mix right - and curate that into a new narrative of place. Above all, remember that food is king - get that right, and you'll bring in the crowds.